Today we are reminded that summer is just around the corner. Temperatures reached 99 degrees here in the Edna Valley today, a record high, just as our Claiborne Vineyard Estate Riesling is finishing up its flowering process. 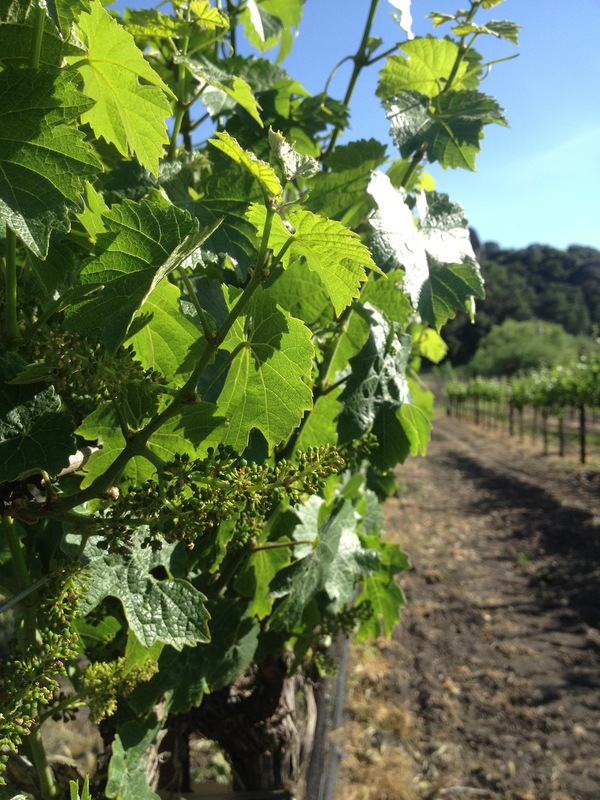 As with bud break this year, the dry and warm winter and spring set the stage for early flowering and fruit set. We figure that at present we are about two and a half weeks ahead of schedule. What does this mean? Well, it really depends on what kind of summer weather is still to come. But if the weather we’ve had the last couple of months is any indication, we are sure to be heading full force into harvest by mid-August. Let’s talk flowers. 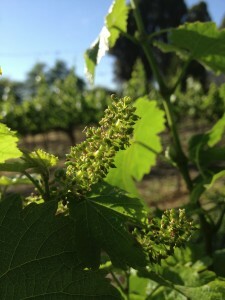 Though a grapevine’s “flowers” are not much to look at, they are an integral part of the vine’s annual cycle, where small flower clusters appear on the tips of the young shoots. At this time pollination and fertilization of the vine take place, resulting in a grape berry. As seen in the photos below, most of the clusters still have a few flowers left. 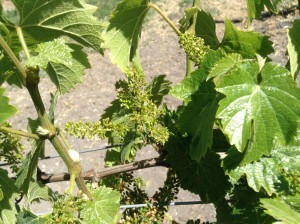 Once they’ve finished flowering, the grape berries will be set and ready for growth. Harvest begins roughly three and a half months from the time of flowering and fruit set. By the look of these clusters, we’re in for an early yet sizable harvest! 2013 Dry Riesling: Just as our supply of the 2012 Dry Riesling runs out, here to the rescue comes the new vintage! Once again it is a harmonious blend of fruit from a vineyard in neighboring Monterey County and a vineyard just down the road from us in our own Edna Valley. Continue reading here. 2012 Dry Muscat: Now here is a wine that’s still flying under the radar. And yet, what a beauty it is! When we tasted it at the winery prior to this wine club release, we were blown away, declaring it a real sleeper, the winning wine of the 2012 vintage. Continue reading here. 2013 Dry Rosé “Cuvée Elizabeth”: Well, it is surely Spring if it’s time for “Cuvee Liz!” This one-time cult favorite of ours has become a regular part of our repertory. And with the rising popularity… Continue reading here. The 2011 “Classic” is a blend of several Pinot Noir clones from a number of vineyards in the Edna Valley. It is an excellent representative of this cool microclimate, which is ideal for the growing of Pinot Noir. Continue reading here.